Tired of composing a text message and seeing “Field Full” when you still have more to say? Then go Beyond160! must-have application for users on Verizon, Sprint, Alltel, U.S.
character limit when composing a text message. Field full? Simply hit Menu –> Go Beyond160 and continue typing as much as you want. Sent messages will go to your normal Outbox. Saved drafts will go to your normal Inbox. Send to one recipient, multiple recipients, or even contact groups you’ve created. they’ll receive it… Then get Beyond160 and experience the freedom! 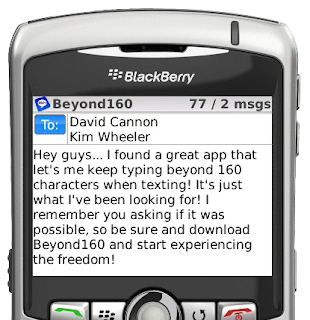 Beyond160 will also work with QuickText, if installed, so try them both for the ultimate in texting efficiency. which is the same as sending 3 individual text messages.